A 45mm capable of remarkable resolving power and sharp images, while the integration of VC into a fast standard prime lens for full-frame DSLR cameras is an industry-first*. This lens delivers crisp and tack-sharp images at any setting from f/1.8 full open aperture. State-of-the-art design and engineering technologies backed by manufacturing know-how culminate in this fine lens and its companion, the SP 35mm F/1.8 Di VC USD (Model F012). The open aperture is set to f/1.8 with optimised critical properties at a higher level: superb optical performance coupled with a VC system, a shorter MOD, and a well-balanced form factor. Rigorous simulation processes performed throughout the design phase are materialised in distinguished resolving power and beautifully tuned background blur, a prominent feature to a fast-aperture, full-frame compliant optic. VC really comes into its own when used on high-resolving professional DSLRs which pick up even subtle camera shake. On fast-aperture lenses, VC dramatically extends the ability to shoot handheld under dim light conditions by eliminating camera shake at slower shutter speeds. This is the very first lens that employs the VC functionality among the fast standard fixed focal lenses in full-frame format*. The USD actuator converts ultrasonic waves into rotational motion that delivers autofocus with responsiveness, accuracy, and speed without so much as a whisper. The photographer can easily use manual focus at any point while the AF system is operating without having to fumble for a switch. New MOD specs let photographers shoot at close range, opening a new world of creative opportunities for composition while maintaining image quality. With an MOD of 0.29m, the SP 45mm offers best-in-class close focusing**. A floating system design feature seamlessly optimises image quality by shifting elements relative to the focus group in close shooting situations. * As of July 2015. Source: Tamron. ** Rated top among current 45mm and 50mm fixed focal length interchangeable AF lenses for full-frame DSLR cameras excluding macro lenses (As of July 2015. Source: Tamron). Constructed to prevent moisture from entering the internal mechanisms of the lens, the SP line is sealed to allow photographers to shoot outdoors in adverse conditions. This SP lens delivers exceptionally uniform illumination levels across the image field to avoid non-linear pattern or fall-off toward corners. 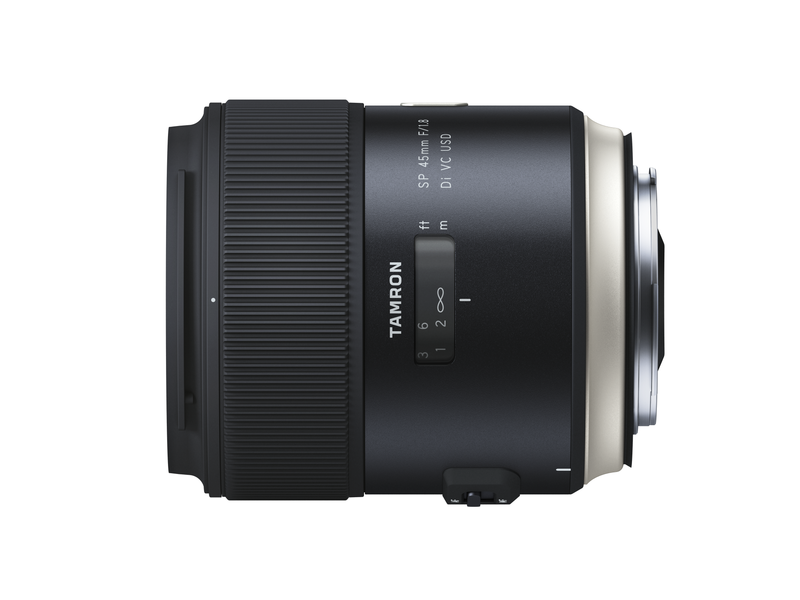 Tamron uses several hybrid aspherical lens elements in its lenses bearing the Aspherical designation. The benefits are two-fold: first, in SP lenses of fixed focal length, molded glass aspherical elements deliver planarity in field curvature. These elements ensure superb focusing uniformity over the entire field by compensating for spherical and comatic aberrations. Second, as one hybrid aspherical lens element can take the place of multiple elements without compromising performance, they allow the lens to be much more compact. BBAR coating provides crystal-clear images by suppressing element surface reflections that lead to ghosting and flare. The number of diaphragm blades affects the “shape” of the blur in out-of-focus areas of the image. This is more important in portraiture, where the aperture setting is often wide open, and macro photography, where the high magnification results in blurred background and foreground even at narrow apertures. When backgrounds are soft and blurred, not only is the effect very pleasing and “photographic”, but it also serves to isolate the subject from a distracting background, providing a professional-looking image. A high number of blades provides a rounder shape to the aperture, which in turn makes the shape of the blur more circular and much more natural.